Outset is the perfect place for people who want to start their own business. They have helped me every step of the way. Looking for a way to combine caring for her four-year old daughter with her love of cooking, Sharmistha Roy decided to set up her own food business from home thanks to support from the award-winning Outset Cornwall start-up programme. Enthusiastic chef and mum of one, Sharmistha Roy has successfully launched her authentic Indian cookery business, Sharmi’s Kitchen to provide a career that fits around her family life. Moving to Cornwall two years ago with her husband and young daughter from Kolkata, India, Sharmistha has long enjoyed a passion for creating and eating healthy yet tasty food. She explains the motivation for setting up on her own. “My husband was the first person to encourage me to bring the authentic taste of Kolkata’s healthy, home cooked street food to the people of Cornwall,” said Sharmistha. Holding dinner parties for the parents of her daughter Anushka’s school friends, Sharmistha was further supported in pursuing her innovative business venture. 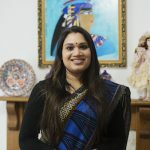 Despite her creative ideas and culinary talent in the kitchen, Sharmistha recognised that she would need help to make the leap from dinner party hostess to food business owner. Hearing an ad on the radio and seeing an advertising poster on a local bus shelter, Sharmistha got in touch with the business start-up experts at Outset Cornwall. Sharmistha has now secured market stalls in key locations in a number of towns in Cornwall, including Truro, Falmouth and Camborne where she is able to bring her culinary delights to local residents and achieve her dream of sharing authentic, home cooked street food with people in Cornwall.